The agricultural commodity ETN, particularly the grain ETNs that have been highlighted recently are now approaching some of the key resistance levels & price targets from those previous updates going back to May. 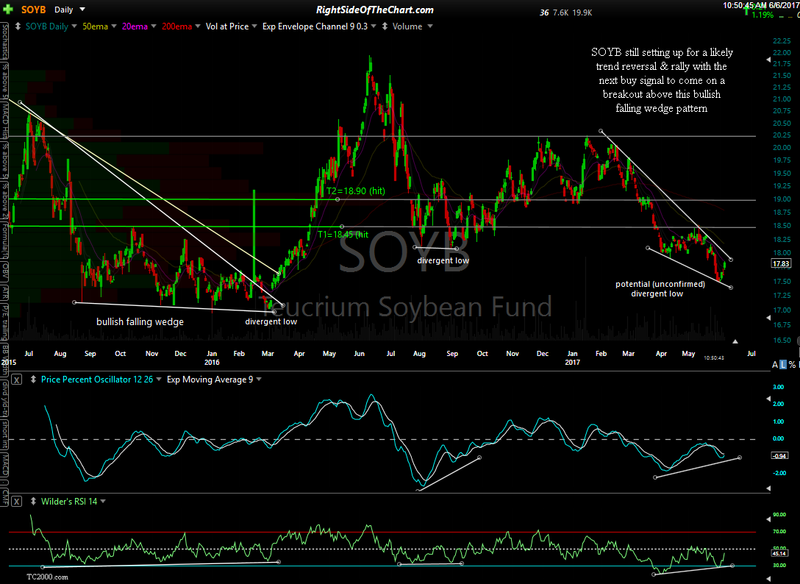 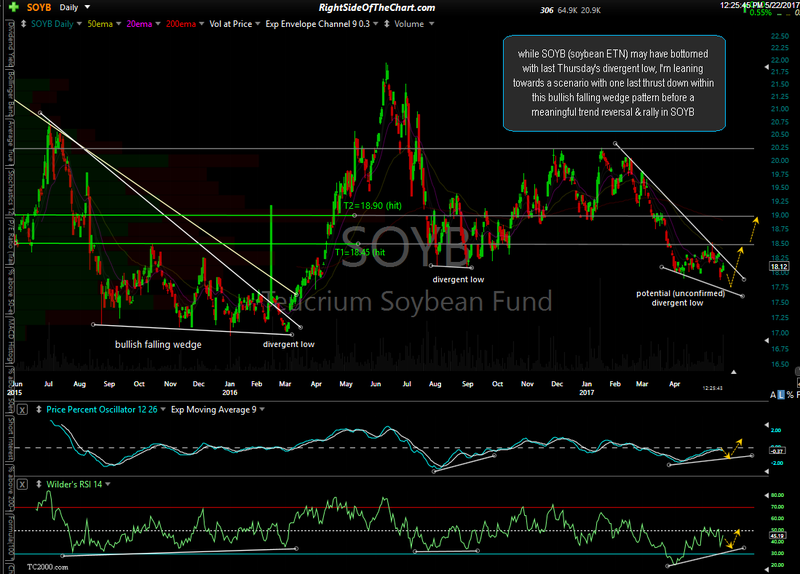 SOYB (soybeans ETF) hasn’t looked back since putting in a divergent low & going on to break out above the bullish falling wedge pattern. 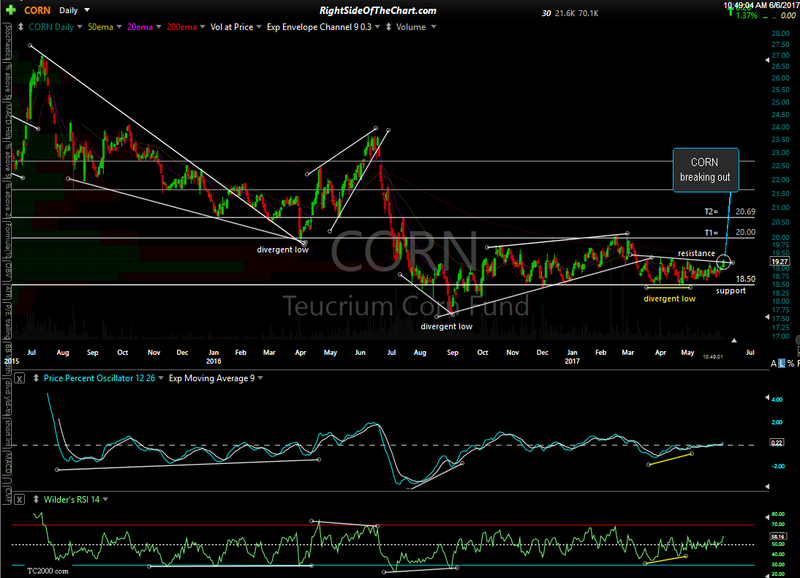 As prices are quite stretched at this time, a pullback to the 19.00-18.80 area would offer the next objective long entry with 18.50 as the next objective support/entry level, should prices correct soon. 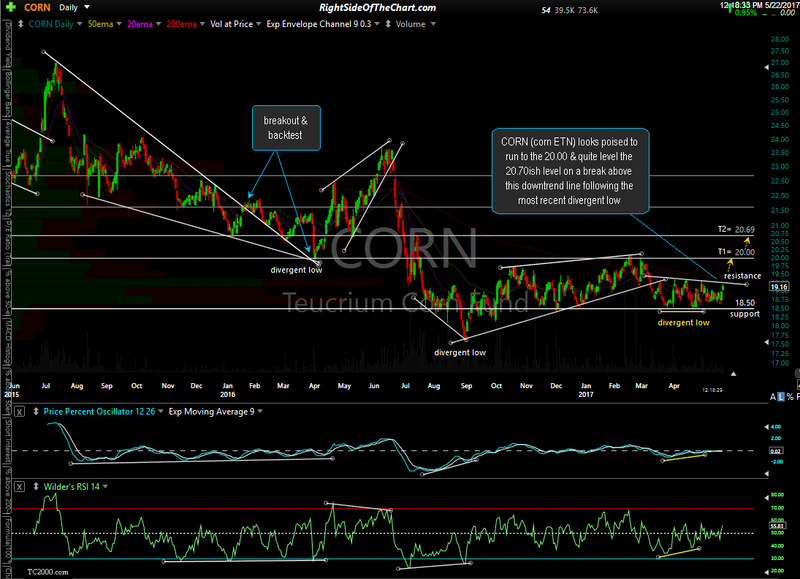 CORN (corn ETN) hit my first price target of 20.00 today, where the odds for a reaction are elevated although I still favor a move up to at least the 20.70ish are in the coming weeks to months. 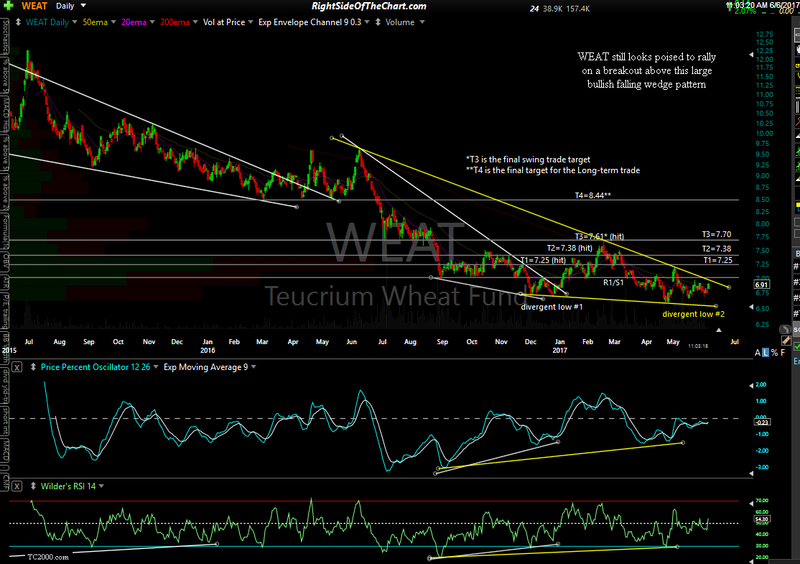 WEAT (wheat ETN) has mounted a very impressive rally following the divergent low back in late April & the subsequent breakout above the bullish falling wedge pattern. 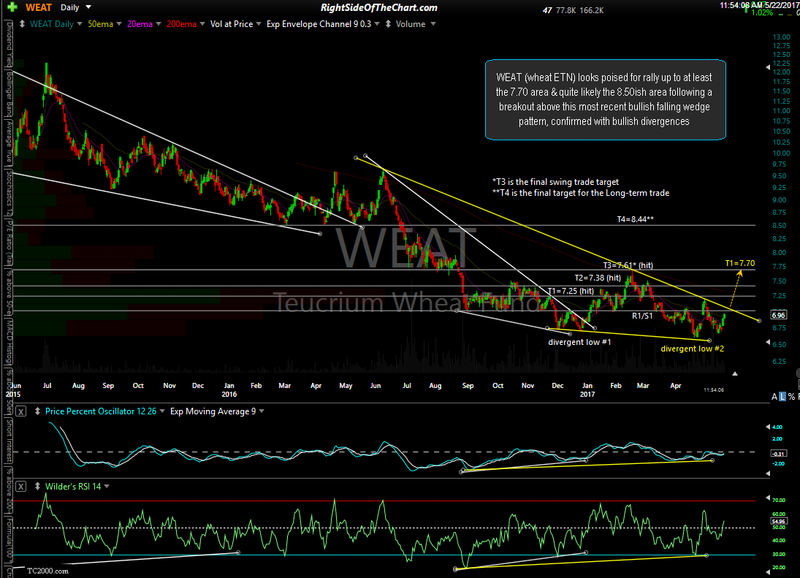 With prices already coming within pennies of my long-term target, WEAT may or may not get one more thrust up to that level soon but either way, it would be best to see a pullback or consolidation before adding to or initiating a position. 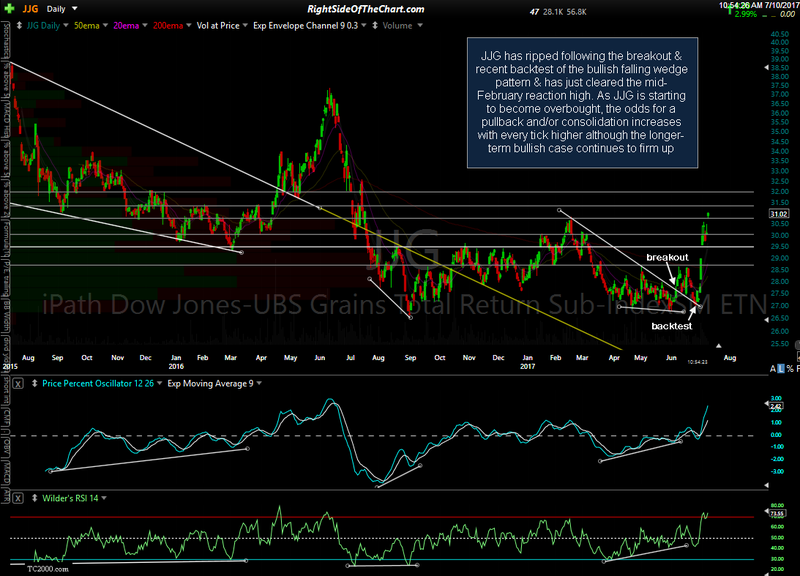 JJG (grains ETN) has ripped following the breakout & recent backtest of the bullish falling wedge pattern & has just cleared the mid-February reaction high. 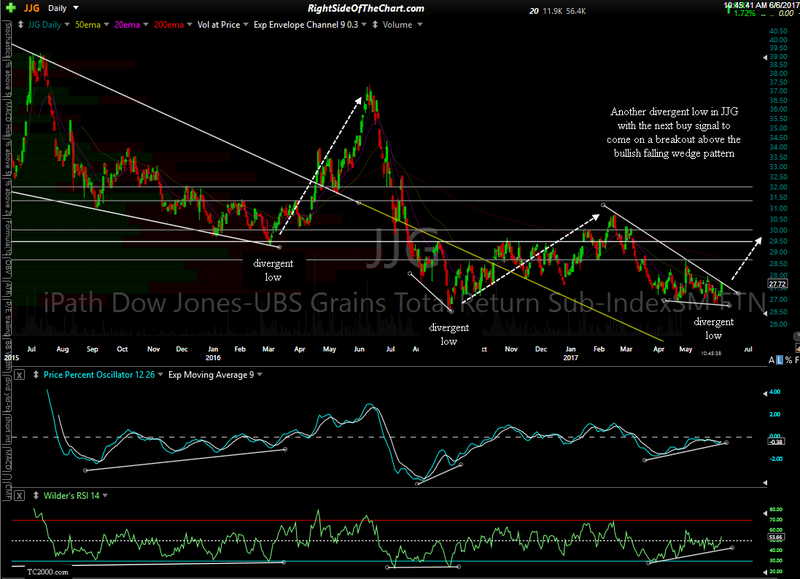 As JJG is starting to become overbought, the odds for a pullback and/or consolidation increases with every tick higher although the longer-term bullish case continues to firm up. 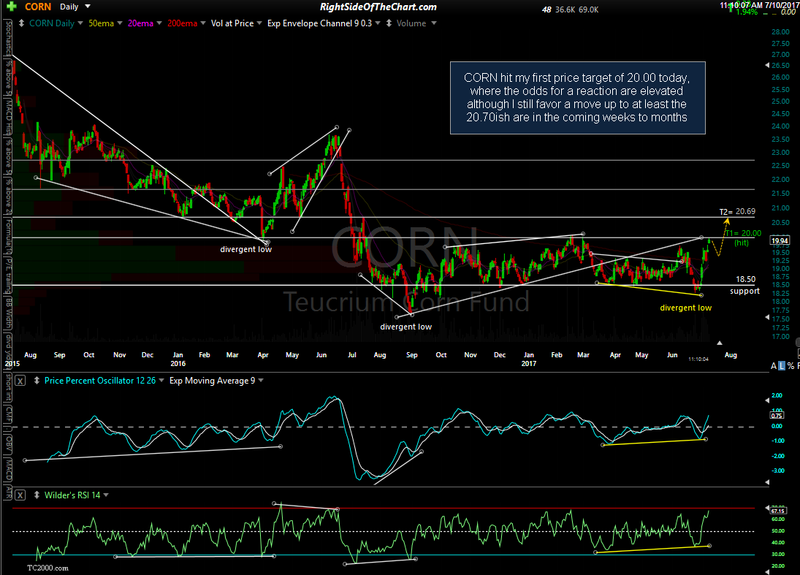 If my suspicions are correct, I think we will continue to see money move out of equities as well as corporate bonds, both investment grade & high-yield, and into select commodities including precious metals over the next year or so. 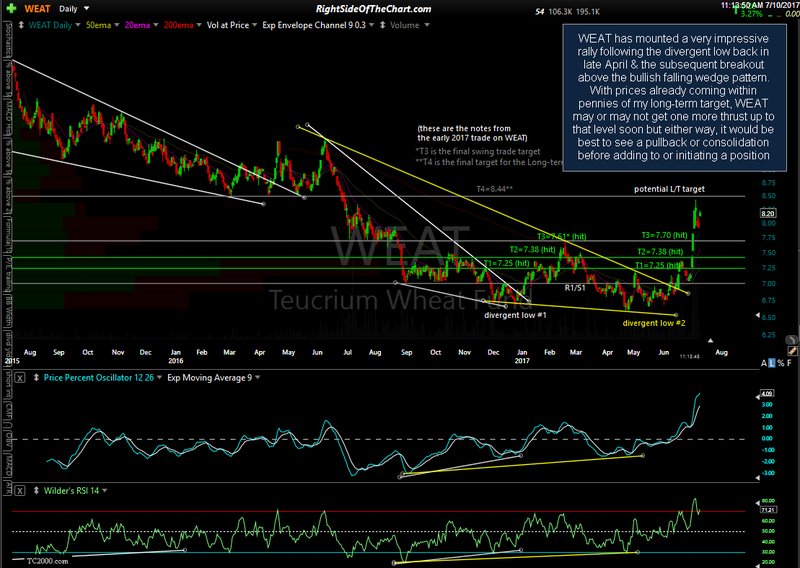 Keep in mind that various commodities, such as grains, livestock, industrial metals, oil & gas, precious metals, etc.. have unrelated fundamentals & quite often, different technical postures although the price of most commodities are usually effected by the trend of the US Dollar to some extent or the other. 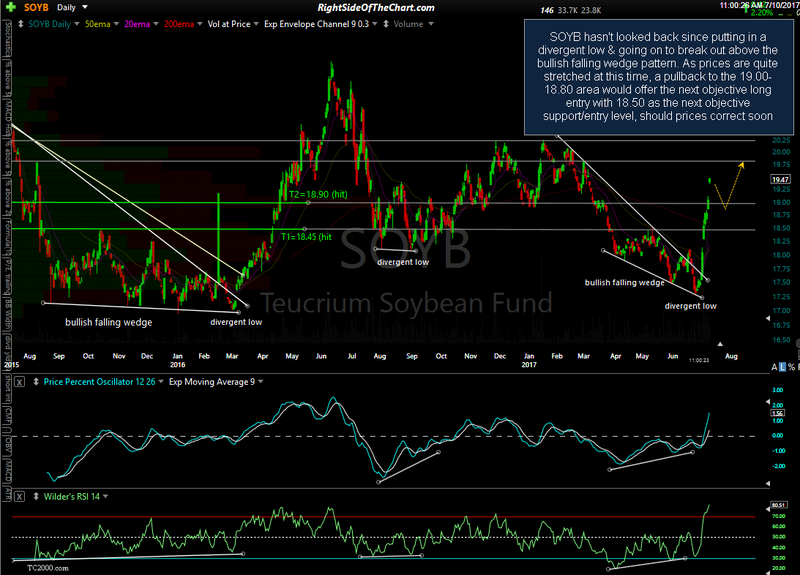 As such & as has been the case recently, I believe it will continue to be a “stock pickers” market in commodities going forward: Identify the most promising trade setups in the commodities arena; get in when the charts indicate a rally, get out once your profit target(s) are hit & the R/R is no longer favorable & move on to the next one or wait patiently for the next objective entry.